Check out The SM 3-day SALE on April 28, 29, and 30, 2017! 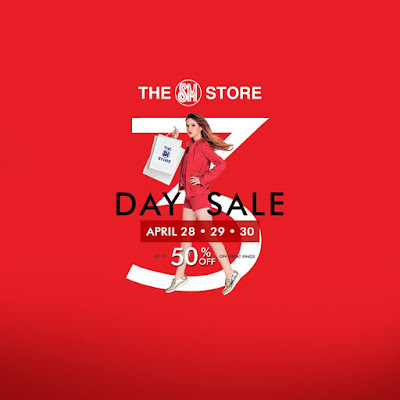 Get up to 50% discount on great finds at The SM Store Megamall, SM Store Bicutan, SM San Mateo, SM San Jose Del Monte, SM Baguio, SM San Fernando, SM Cauayan, SM Sta. Rosa, SM Batangas, SM Trece Martires, SM Naga, SM Seaside City Cebu, SM Davao, SM Cagayan de Oro, SM Center Las Pinas, SM Center Sangandaan, and SM Center Angono. Plus, get a chance to win a gadget package from Globe, bring home a shopping trolley for only P699, and enjoy BDO rebates! SM Prestige, and BDO Rewards cardholders get extra 10% OFF during the SM Prestige Exclusive Sale on Friday, April 28, 2017 when you shop at The SM Store SM Megamall, SM Bicutan, SM San Mateo, SM San Jose Del Monte, SM Baguio, SM San Fernando, SM Cauayan, SM Sta. Rosa, SM Batangas, SM Trece Martires, SM Naga, SM Seaside City Cebu, SM Davao, SM Cagayan de Oro, SM Center Las Pinas, SM Center Sangandaan, and SM Center Angono. 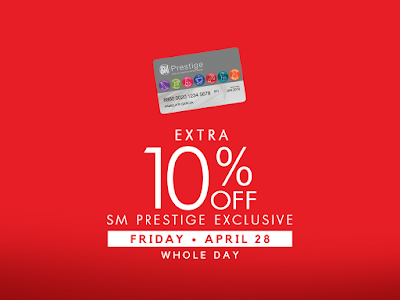 SM Advantage, SM Prestige, and BDO Rewards cardholders get extra 10% OFF during the SMAC Morning Special on Saturday, April 29, 2017, up to 12 NOON when you shop at The SM Store!